Is it Time to Rescreen Seasonal Employees? The holidays are approaching and ecommerce and brick-and-mortar retailers are already hiring for the season. Some retailers also employ some of the same individuals as previous seasons. With the mad rush of seasonal hiring and the familiarity of previous seasonal employees, background screening may be skipped because it costs too much or takes too long. Employers must consider that 30% of merchandise or cash stolen is due to employee theft. Even a temporary or trusted employee can cause damage to a retail business' bottom line, reputation, and more. Retailers: Is it time to screen or rescreen seasonal employees? Here are some questions to consider to understand why background checks are important to seasonal hiring. Can Seasonal Employees Damage My Business? An annual retail theft survey stated that over 53,000 retail employees were apprehended and over $42 million was recovered from thieving employees in 2016. In fact, based on over 1.4 million employees, one in every 27 was found guilty of employer theft in 2016. These numbers are up over 9% since 2015. Employees can steal from an employer's bottom line by lying about the time they're actually working. "Buddy punching", when an hourly employee asks another employee to clock in or clock out on their behalf, is a trend that is costing employees over $373 million each year. Stealing from customers is another way that seasonal employees can damage your business. A 2017 report states that "card not present" (CNP) fraud is rising. With CNP fraud, ecommerce transactions are successful even though the card isn't physically seen. Employees are stealing card information, through online or in person purchase, and using it to make fraudulent purchases. Recent data breaches from large retail and credit organizations already have consumers on edge without having to worry about using their credit cards during the holidays. If ecommerce and other retailers are using some of the same seasonal employees, year after year, they may be hesitant to run background checks on previous employees. While there may be concerns that the background check causes an inconvenience to the employee, it could be a small task that makes a big difference. Some time has passed since the previous background check. The employee may have had hardships that affect their ability to be as trusted as before. If the employees are going to be handling financial transactions, where they were previously restocking or wrapping, for instance, they may require a more stringent screening that includes a credit check or financial history. The employee may not have been screened previously and, even though there were no incidents before, should be screened with the same standards as new hires. Can My Business Save Time and Money on Background Checks? Besides potentially preventing workplace thefts, violence, and negligent hiring claims, retailers can also save time and money when they choose to screen seasonal employees. There's no need to avoid background checks because of the cost and wait associated when the employees need to begin working immediately. Hiring lots of employees quickly? VeriFirst Background Screening offers special discounts for high volume background checks. 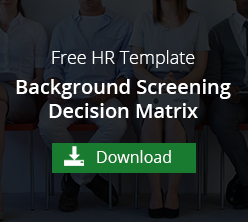 Save time by not running every background check on every employee. VeriFirst also offers employers the ability to pay for only the screens that are needed. If the seasonal employee is hired full-time after the holidays (70% of employers expect to hire for permanent roles), the employee's history has already been investigated and the employer already knows they are a good fit for the company. Let your employees apply online. Use an applicant portal that not only builds ease in the hiring process, but is also FCRA compliant when obtaining consent for a background check. When employees can enter their own applicant information via a portal, the potential for data entry errors is reduced. Obtaining consent and limiting which background checks are needed are helpful in reducing the amount of time for screening turnaround. These processes also make the process less costly and efficient. To learn more about the VeriFirst applicant portal, available to employers with VeriFirst background checks, click the link below. 35% of employers are planning to hire extra help during the holidays. With the rise of employee theft and fraud, ecommerce and in-store retailers must be diligent about screening employees. Even if an employee has worked for the business previous seasons, it is still a good idea to run another background check. Have any questions about time, cost, or creating an efficient screening process? Ask us! We'd love to help.